On the morning of Tuesday August 8th La Presse published an article reporting on a draft contract which would see Ontario pay Quebec approximately $500 million a year for the ability to import 8 terawatt-hours of electricity. By late morning the office of Ontario's energy minister denied an agreement was reached, and the ruling Liberal party's press office was slamming the opposition party for "spreading misinformation." Perhaps nothing will come of the proposal, but it's worth noting what constituency it is designed to appease, how that appeasement impacted the draft agreement, and the concerns all Ontarians should have with the processes, and institutions, involved in the province's electricity sector. July 27 Ontario's Thibeault writes the June offer was "inconsistent with our discussions in May", notes following discussions between staffs of Premier's Couillard and Wynne HQ "would be instructed to work collaboratively with IESO on enhancing electricity trade..."
I think Thibeault's July 27th is very good. To communicate why, I will focus on a short technical quote from the leaked draft agreement which explains the shortcomings of Hydro-Quebec's proposal. First I'll note 8 TWh, the proposed annual import level, is only slightly higher than the total annual imports into Ontario from Quebec (much of which will be wheeled through to New York). There was some noise about whether the amounts were feasible with existing infrastructure: they are. I'll translate: Hydro Quebec will provide at least 1,000 MW unless the inter-connection capacity is not available. The negative price is below the current minimum pricing of flexible nuclear and wind - none of which have anything to do with what suppliers are paid, but which determine the dispatch order if too much supply is available. 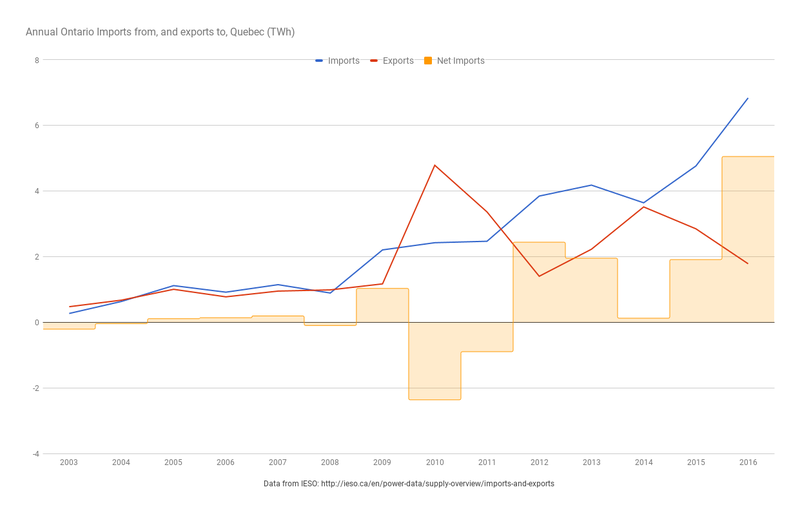 The outcome is all Ontario supply would be subject to curtailment prior to the Quebec imports. This contract seems designed to help Quebec avoid a supply shock at the end of their Churchill Falls deal. Dates aside - there's an argument where reducing baseload capacity while finding a better deal on 1000 MW of some baseload make good sense. But contracting any more baseload while restricting hydro-electric resources to baseload duty does not. ...[the December 2016 Argreement's] flexible arrangements have allowed for the achievement of the objectives of reducting ratepayer costs and greenhouse gases (GHG) emissions, while operating within Ontario's wholesale market. There's a lot of meaning in these points, including support for a market redesign initiative at the system operation (IESO), acknowledging the current need for flexibilty, and recognizing the poor value to Ontario ratepayers of prioritizing buying $2/MWh Labrador power at $61/MWh, via Quebec, over already contracting local supply. The deal Quebec drove for land-locked Labrador supply doesn't appear to be motivating Ontarians pushing for a deal here - but the situations aren't entirely dissimilar, and without support for Quebec's transmission plans into New York and New England, the similarities might persist. On a broader level, the role of hydro-electric in lowering emissions in grids defined by very large market shares of sporadic generators (wind and solar) has been the star in the drama where academics revealed the shortcomings of a Wind-Water-Solar pop star. Visions of low emissions grids with variable renewable power need higher amounts of dispatchable hydro-electric supply - not more of it operating as baseload generation. The most concerning aspect of the material released Tuesday are what they communicate about Ontario's political culture. The offer was made to a new head of Ontario's nominally Independent Electricity System Operator only 2 days after he took over that position - apparently in response to discussions at a political, poorly informed, level. The offer ran counter to the Market Renewal Initiatives at the IESO - which Minister Thibeault has indicated will centre a pending Long-term energy plan. It was already unclear the IESO should remain the market operator if there was to be actual renewal, having overseen a decade of movement away from generators exposed to market pricing while seeing the fastest growing consumer rates in North America. It is now also unclear if the new boss isn't a political appointee with an agenda separate from that of achieving better value for consumers through improved market mechanisms. The revelation that Premiers' offices will be holding discussions is an ominous note from Thibeault's mostly positive July 27th letter. As refreshing as it is to see the Minister displaying an understanding of his portfolio, it is more disappointing to see the Premier's staff displacing Ministry, and system operator, expertise. It might be amusing if the HQ offer for a a 20-year contract at $61/MWh was accepted by Ontario's Premier in order to be charged out to consumers today at $46/MWh - with additional recovery pushed out beyond 20 years. It might not be amusing. If there is a contract the system is already, ridiculously, structured to delay recovery of any new contract costs. Allison Jones' report on the negotiations contains an excellent summary of reactions from a number of entities in Ontario's electricity sector, including the Society of Energy Professionals, the Ontario Energy Association, the Association of Power Producers of Ontario and The Ontario Waterpower Association.